Casting gender stereotypes aside, Anne Bonny proved that you didn't have to be a man to be a pirate. Armed with two pistols, a cutlass, and a boarding axe, this 5-1/4" (13.3 cm) tall, hard vinyl version of Anne Bonny is ready to rough up all of your boy action figures. 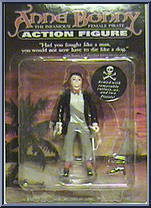 Contribute pictures, update details or suggest corrections for Anne Bonny Pirate. Write a review about Anne Bonny Pirate.